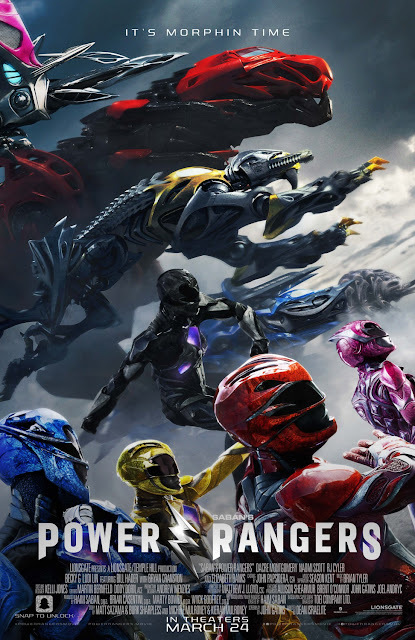 From the very beginning, compared to the Power Rangers TV series, the film sets a dark tone. Not only was the darker tone appreciated, but so was the additional backstory that was given about some prominent characters. 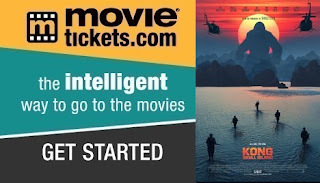 Given that fact, the movie diverges to some degree from the television series and there are a few twists in the plot that you may not expect. In this Power Rangers movie, there are actually deeper themes and struggles within all of the characters. Some specific characters actually have different motivations than what the TV show initially demonstrated. Each one goes through some sort of drama or challenge that helps shape and define who they are. In a sense, you actually have legitimate "troubled teens" who have real world issues. Thankfully, it wasn't a cheap and cheesy write off like "Oh no, I don't think I'll get an A+ in Math class. I'm really bummed out.". *cue dramatic sad music* Instead the movie presents a very diverse cast that's also pretty inclusive. For example, one of the characters is "on the spectrum" meaning that they have a form autism. While it is nice to see the journey that the group of teens take into becoming the Power Rangers, it does take a while for it to happen. It almost felt like it took 1.5 hours until they finally morph. (Keep in mind the movie is 2hrs long.) So that means you only get about 30 mins or so of real action, which in a way leaves more to be desired. Goldar was a mess. It was just visually displeasing to see on the screen. He looked like golden, walking vomit. His conception probably sounded great, but the execution was just poor and didn't translate well on screen. Unlike many other instances in this film, this was probably the one thing that the TV show does better. Another issue for me was the fact that the film felt the need to consistently show the faces of the Power Rangers while they were in their suits. I thought that it completely disrupted the entire fantasy/illusion and it also was counter productive to the long anticipation of them finally morphing. Not to mention the fact that it doesn't really help the idea of protecting their identities. All in all, Power Rangers (2017) was much better than expected. You can easily tell that it's not necessarily for young kids. Actually, I'd probably go as far as to say that this movie isn't for people over the age of 36 either. 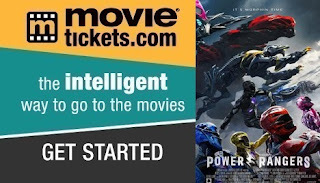 It's probably best appreciated by those between the ages of 12-35, grew up at least enjoying a few seasons of the TV show, and enjoy movies like the recent Transformers series. If you couldn't tell by the trailer, this movie is almost identical to the movie Chronicle (2012). It encompasses that nostalgic feeling of the TV series, while still being modern and updated enough to stand on its own. Personally, after being apprehensive about the news that there would be five more sequels, I'm actually very okay with seeing what's to come. Matter of fact, I hope they do a prequel movie too. This isn't the most major issue, but I'd probably say that due to the language of the film. It is PG-13 for a reason. You'll hear some A-words and S-words and BS. Also, unlike the TV show you won't hear them say "I shall destroy you!!". No, instead they just come right out and say things like, "We are going to KILL them!". You also have some scenes of under-aged drinking and so on. There are also just a few quick scenes that may be a little scary for kids younger than 7 or 8. I think it's well worth the watch in theaters. If you were on the fence, just go and you'll be fine. There's a mid-credit scene so you can stay and check it out when the film ends. It's a little predictable, but whatever. You're probably already invested and interested, so just sit back and enjoy. The essential goal of Feng Shui is to harness the good chi and be rid of the negative chi. Often times things will have to be reassessed or balanced out. The goal I purpose here is to address some of the negative "chi" that I thought plagued the Iron Fist series in hopes that more positive chi will restore the series if the character is given a second season. 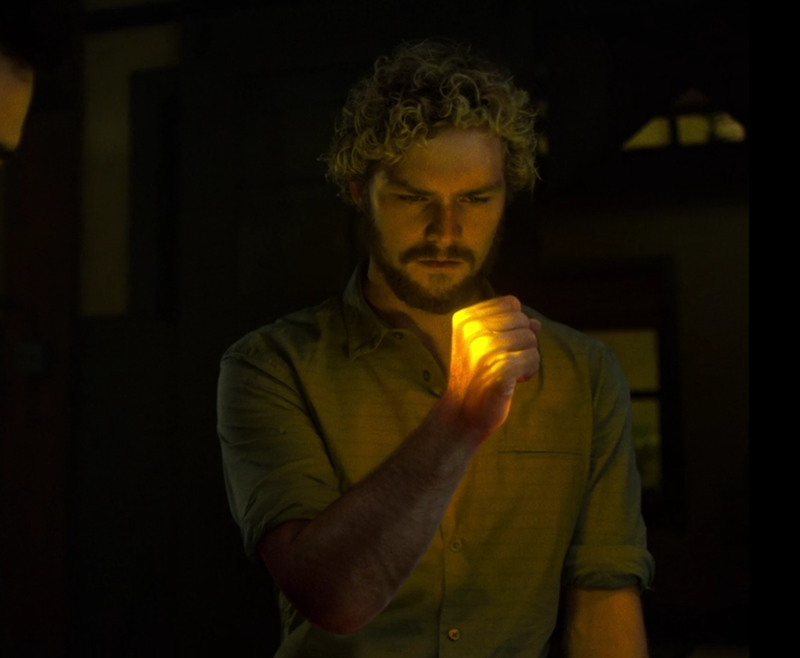 Sadly, after completing the show, I came to the conclusion that "Iron Fist" is a disappointment for Marvel in comparison to their other shows. Rather than just bashing them, I thought I'd give some constructive criticism to help them realign their chi in a sense. Don't want to miss future blogs, reviews, and contests? Enjoyed this blog? Share it and let me know what you thought. 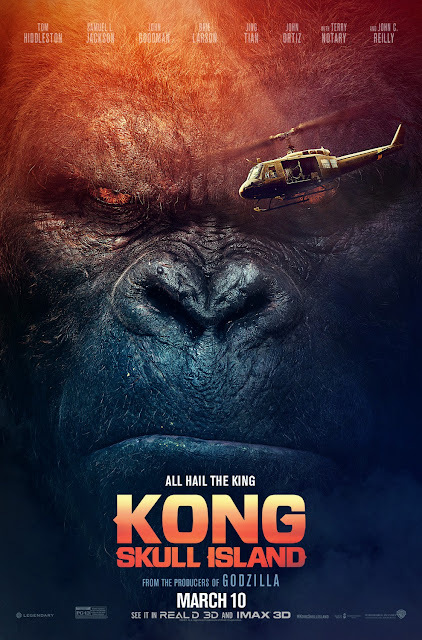 Unlike the previous Godzilla 2014 film (Read my review here) we get a lot more of Kong throughout the film. Matter of fact, it doesn't take very long for him to appear on the screen either. This may be one of the best depictions of King Kong given the fact that this film doesn't really hold back with his level of destruction. The movie is only PG-13, but there are moments where the violence would make one think it was bordering the rated R level. I personally enjoyed the fact that they made Kong more expressive than just a big raging monster. You can read his emotions and can get behind him as a character. Kong: Skull Island is truly a "monster film". The various creatures that populate the island almost give you the same feeling that you may have had when you watched Jurassic Park for the very first time. The movie includes some great camera angles and shots, but also some shocking death scenes as well. The havoc and chaos that the monsters evoke will keep your eyes glued to the screen. As far as the characters go, I'd probably say that after seeing this film, I am now 110% convinced that Tom Hiddleston should be the new James Bond. Period. We don't need to debate this because it's already settled. He has a few moments in the film that show you the potential of being, not just suave and debonair, but fully capable of getting his hands dirty with some action scenes too. Samuel L. Jackson is exactly who we've come to expect and love with his character. John C. Reilly simply runs away with the comedic relief in the movie. His comedy was well timed and helped lighten the mood during some intense moments. The supporting cast including Jason Mitchell, John Goodman, and others were also really solid. I will also say that I was very happy to see some predictable Hollywood tropes not happen. I suppose one issue is just the mere fact that there wasn't really anything ground breaking or new with this film. You've seen big monsters on the screen before. You've seen monsters fight on screen before too. It's entertaining, but like I said, nothing really all that original. This may be a bit of nitpicking, but the film seemed to have some sort of difficulty with its character development. Throughout the film we are introduced to a variety of characters. However, it seemed difficult to really get attached to most of them. Besides that, I could've sworn they added a bunch of extra soldiers to the film to be used as collateral damage. At one point it felt like we were only dealing with about 7 characters but 20 get included in the battle scenes. Kong: Skull Island was definitely an entertaining film. It's a nice stepping stone to continue building the mythos that the studios are creating with this "monster universe". For those wondering, yes, there is an end credit scene that teases a connection to future movies. It's well worth the watch in theaters, so feel free to plan your weekend to check it out. I saw the film in 2D and thought it was just fine in that format. One of the best highlights of this film were the interesting backstories for some of the characters. I wanted to see more of them, but this time we get to see a little bit more as to what shaped the Prince/Beast. We also get a little backstory with Belle too. Seeing as though the majority of the story is pretty much the same as the 1991 animated film (aannnnnd now I feel old), it was nice to see something new to the story that we may not have known before. As you can probably tell from the trailers, the visuals are indeed captivating and eye catching. The animation of the servants were done very well, and nothing that you wouldn't expect from Disney. There were some humorous moments that will get you to chuckle here and there. Beyond all that, kudos to Disney for clearly showcasing a very obvious diverse and inclusive cast depiction of the film. The servants, like Lumière or Cogsworth, were certainly entertaining. Probably the one standout character was Luke Evans as Gaston. He definitely embodied the arrogant role for the entire movie. For some reason, maybe the pacing, the movie felt unnecessarily longer than it needed it needed to be. Besides the brief backstories about the characters, there really wasn't much else about the film that was new. I suppose I was kind of hoping that this live-action version would take a similar route to the Jungle Book (2016), which did show a slightly different adaptation compared to the animated version. Not sure if this would quantify being good or not, but it was kind of difficult to pinpoint the intended audience for this film. It felt more like something for teens to adults (who had seen the previous animated film) and not as welcoming for new and/or younger audiences. Along with that, due to their more inclusive measures taken with some characters, it may cause some divisive opinions to be made by some audiences. (Whether those opinions are warranted or not, I'll let you be the judge.) I think that by over emphasizing the intentionality of being more inclusive may rub some people the wrong way. While I personally have no issue with being more inclusive, I do think that it becomes counter productive of trying to normalize something when it does get highlighted specifically in a film. 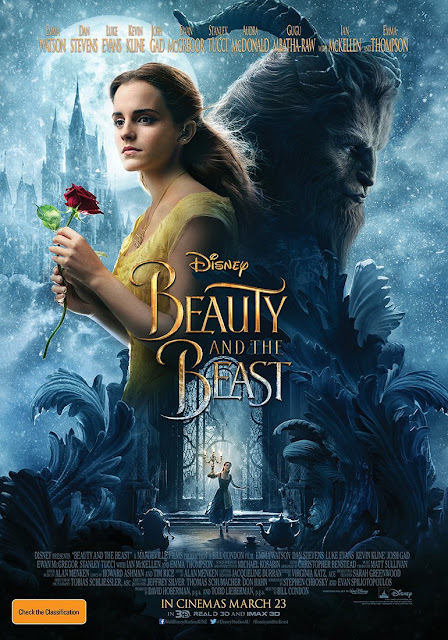 Overall I'd probably say that this live action version of Beauty and the Beast was more so nostalgic than it was magical. Maybe those who enjoy musicals will appreciate and like this movie more than I did. It simply just didn't move me the same way that the animated film did when I was younger. (And I was a fan of the animated film too.) I wanted something new and different in this film while still connecting with that sentimental feeling. Unfortunately there wasn't enough "new" and there was only a long trip down memory lane. Regardless of how I personally felt about the movie, I still think that others will enjoy it. Parents, I wouldn't really advise this for kids under 13 years old. There really isn't much silly or animated humor that would keep the average kid's attention. Also as I mentioned, some parents may or may not be comfortable with some of the suggested themes in the film for young children. (Again, you be the judge.) I would say to really base your thoughts on how the trailer made you feel. If you love musicals then you'll probably enjoy this live action film. It's theater-worthy for you. If you loved the animated film and are hoping to recapture the magic from your childhood, I'd probably say you could hold off for the time being. We finally get the depiction of Wolverine that we've been waiting for! From the very beginning we get to see the hero do what he does best. The level of savagery is at an all time high and completely warrants the R rating placed on the film. (Parents, be warned. 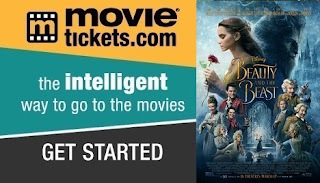 This is NOT a Disney movie to bring your small children to see.) There was a lot more violence, swearing, and gore than you're probably used to (but probably always wished for) in this Wolverine film. In addition to that, the movie is very loosely based off the Old Man Logan comic. If anything, the only real correlation to the comic is that Wolverine is old. What I can really appreciate is how this film manages to go from being a complete action packed collection of violence to having some really tender and dramatic moments that reek of emotion. I completely understand why Hugh Jackman signed off to do this film. 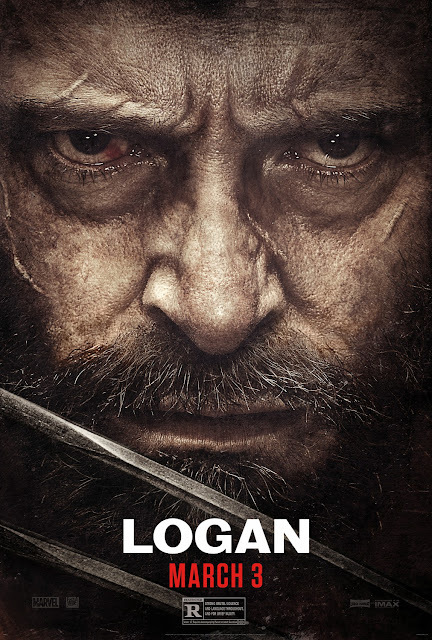 Unlike the previous Wolverine films, he gets to fully explore and portray the emotional depths of the Logan character. You can almost feel all of his emotions throughout the entire film. He becomes the complex character that he's always been in the comics. He's the tragic hero that has real issues, but still rises to the occasion when necessary. As you may have been able to tell in the trailers, X-23 (played by Dafne Keen) is a star in the making. She was a definite highlight in the movie. She had some great scenes that showed her truly being able to hang with Wolverine on multiple levels. She was relentless and definitely not the Disney friendly type of kid she may appear to be. There's definitely a nice little surprise towards the later parts of the film, and I personally think that it's fan service for the tragedy that was X-Men Origins: Wolverine. Matter of fact, there's a lot of fan service done here. Plenty of easter eggs that pay homage to the past X-Men films, and to comic fans in general. There are few questions that I know many of you may be thinking. "Was this the best Wolverine movie to date?" Yes. "Was this the best film from Fox and all their X-Men movies?" Yes, but I would say that it's equal to and/or slightly better than Deadpool in my opinion. "Is this one of the best comic book movies to date?" I'd probably say there's no question it's in the top 10, but the top 5 is where the real conversation should be had. "Will this be the last time we see Wolverine?" I don't know, but with this movie, I would say it really doesn't matter. I would probably argue that the main reason why Logan should probably be in the top 5 (of comic book movies) is primarily due to the fact that it's one of the only films that actually hits you emotionally. The drama in Logan is incomparable to any other comic book movie out there, and that, for me, places it leaps and bounds above others. There is little to no question, that after this film, it's going to be an extremely tall order for anyone to even try and become the new Wolverine. (We know there will be others. The character is too much of a cash cow for there not to be.) Essentially, there should be a #ThankDeadpool trend going around for this film. Without Deadpool, this Logan film may not have been posible given how successful a rated R comic movie can be. 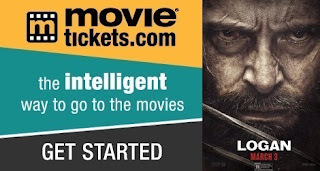 Either way, Logan is a must watch in my opinion. I think that it's the type of movie that will actually transcend both comic book fans and causal movie fans alike. The blend of drama and action and deep characters is everything that makes any movie worth watching. Go see it, and don't even think twice about it.